There's just so much wrong with the television show Yes, Dear. It came it a time when people on TV got to marry way out of their league. And to be honest, it's a pretty tame series and it's hard to believe that this show was created by the same guy who created My Name Is Earl and Raising Hope. But somehow, Yes, Dear is one of my favorite TV shows. I can watch it any time it is on and it makes me laugh. 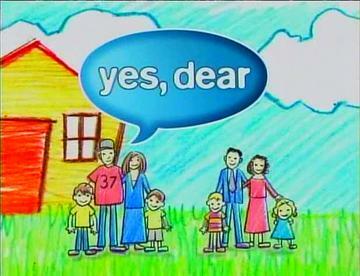 Yes, Dear premiered October 2, 2000 and it was not expected to be a big hit. "TV Guide" felt there just weren't enough laughs in the show but being sandwiched between The King of Queens (1998-2007) and Everybody Loves Raymond (1996-2005) more than likely helped propel the series into a second season. The second season show better ratings than the previous. For the fourth season, CBS moved Yes, Dear as a lead in to the entire night (which also included Still Standing [2002-06], Raymond and Two and a Half Men [2004- ]) and the ratings plummeted causing CBS to cancel the show but then order 13 episodes for midseason just in case. CBS canceled the John Goodman comedy Center of the Universe (2004-05) after only 10 episodes and put on Yes, Dear, which did better in the ratings and received a sixth season pickup but for only another 13 episodes. Yes, Dear ended February 15, 2006 and was replaced by Out of Practice (2005-06) which aired it's final two episodes of the 14 it did air of the 22 ordered. From TV Guide. From left, Clark, Snyder, O'Malley, Kelly. People considered Yes, Dear an immediate failure before its premiere because all of the actors previous credits featured failed series. Anthony Clark was on Boston Common (1996-97, 32 eps. ), Jean Louisa Kelly was on Cold Feet (1999, 4 eps. ), Mike O'Malley was on The Mike O'Malley Show (1999, 2 eps.) and Liza Snyder was on Jesse (1998-2000, 42 eps.). Jesse is the only so-called hit but lost a lot of viewers gained from its lead-in Friends (1994-2004). What's even more amazing is what happened to one of the actors after the series ended. Mike O'Malley currently stars in the hit show Glee (2009- ) playing Kurt's (the gay kid) father. O'Malley even earned an Emmy nomination. Yes, Dear has some laugh out loud moments. One of my favorite scenes features Brian Doyle Murray as George Savitsky trying to get a Bop-It game from Greg (Clark). I don't watch The Walking Dead but aren't zombies the walking dead? I'm not a fan of broccoli but it is better when mixed in with something. My favorite is chopped broccoli mixed in with chicken, rice and Velveeta. Yum.